Job burnout reduces productivity, increases absenteeism, and leads to stress related illnesses. What are the signs and symptoms of burnout and what strategies reduce job burnout? Do you get to the end of the day and feel frazzled and drained? 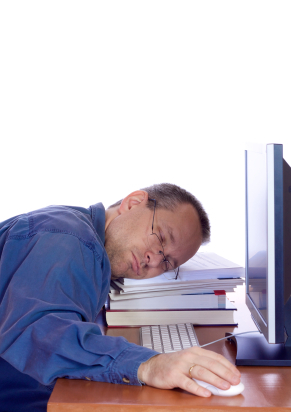 Are you exhausted and tired of your work? Do you suffer from stress at work on a daily basis? If so, then you may be battling with burnout which stifles enthusiasm and saps motivation. While you may still have the skills to perform, the will to perform is gone! Millions suffer from burnout every year. Burnout is a signal that you have been doing things in a way that doesn't work in the long term. A definition of Job burnout is to "exhaust your physical and mental resources ...to wear out oneself by excessively striving to meet unrealistic expectations" (Brown, 1993). Does your day leave you exhausted? Are you striving to meet unrealistic expectations? Are you feeling increasingly helpless in your current work situation? Whether these are your expectations or others, these are some common indicators of job burnout. You may think that stress goes with the territory as you take on more work and have more deadlines. While you may think that you are adapting to higher levels of stress, you may just be living with an unhealthy amount of stress. In a poll of American workers, over 50% of workers said they were less productive due to job stress. But work stress means more than just loss of productivity. Stress and health are closely connected. The Journal of Occupational and Environmental Medicine reports that medical expenditures are 50% higher for those who report high stress at work, compared to those that don't report high work stress. Job burnout affects the individual and the organization. The individual who suffers burnout is more likely to suffer stress related illnesses and be more susceptible anxiety and depression. At the organizational level there is likely to be less worker morale, increased absenteeism, more disengagement, and lower productivity. There are a number of things that the organization and the individual can do to reduce job burnout. Reduce a culture of overtime. Reduce a culture of overtime and promote a culture of organizational support. Studies show that the more organizational support that employees receive around their work and decisions the less job burnout (Amstrong-Stassen, 2004). Increase empowerment. Empower people in the decisions that they make in their workplace. Foster a culture of that promotes balancing work and family time. Research shows that family support and organizational support reduce burnout, and fostering work life balance promotes this support. Provide positive feedback. Studies show that if supervisors provide feedback that is positive about the abilities and skills of the individuals on their team then there is less burnout (Russell et al., 1987). Schedule time for relaxation. Schedule time in your time management planner for relaxation or stress management techniques. Chronic stress can mean that your stress response is constantly activated. By learning relaxation techniques you can activate teh relaxation response and counter the effects of stress. Exercise more. Exercise reduces stress and stops your muscles from accumulating stress-related hormones in your body. One of the stress symptoms is increased muscle tension. Exercise can use-up this accumulated muscle tension. Eat well. Just as you wouldn't expect your car to run with no fuel, you can't expect your body to work optimally if you don't eat a balanced diet. Get up 5 minutes earlier and make a freshly packed lunch. Take regular breaks. There is a long history of research that highlights that regular breaks give your body the chance to recuperate and enhances productivity. Get up from the desk and take a walk. Don't take work home. This can be hard to do when mobiles and technology can mean that we are expected to be available 24/7. Setting strong boundaries between work and home is essential. When at home focus on the family, and when at work focus on your high impact activities. Develop your time management skills. If you have a to do list as long as your arm and you feel stressed with too much to do and not enough time then improve your time management at work. Learn how to delegate effectively and use these time management tips to focus on your high impact activities. At the same time improve your time management at home with family time management and family goal setting. Meaning and purpose. If you job lacks meaning or purpose for you then you are a higher risk of burnout. Furthermore you are spending a great deal of your day doing something in which the values or the work aren't aligned with the type of person you want to be. Career goal setting can be the first step to a job that is more meaningful to you.